Wedding sheet cake ideas that will save you a fortune! It is one of those wedding secrets that noone will know anyone that has done it but thousands will be creating sheet cakes for their wedding without their guests having a clue. If you have been to a big wedding recently it is quite likely that the bride will have chosen to have a sheet cake in addition to her wedding cake. So what is a wedding sheet cake? All it is, is a big, flat, normally rectangular, cake that has been decorated in the same colored icing as the main wedding cake. The idea is that there will be a wedding cake for show that will be used for the photos and that the guests see, but to save money it won't be big enough to feed all of your guests. In addition to the main cake there will be a sheet cake that is cut as well. 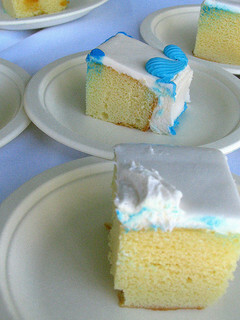 As the wedding sheet cake is iced in the same colors no one will see a difference and you save yourself lots of money! You save money because a sheet cake costs less to ice as it is normally less detailed but it still tastes the same. A perfect way to save money at your wedding without anyone knowing. You could save even more money on your wedding cake if you make your sheet cake yourself. It makes sense that you leave the intricate wedding cake to the professionals because they are good at all the detail. But a flat rectangular sheet cake most people could bake! Decorate your own wedding sheet cake without anyone noticing what you have done by keeping the icing the same color. That will be a lot easier if you are having a white iced wedding cake! Also if your main wedding cake is being iced with fondant icing then you can buy that already made in most grocery stores. To save yourselves even more money and if your wedding venue is charging you to cut and portion the wedding cake, see if you can cut the cake yourselves and deliver the cake to the venue already wrapped for each guest to take home. If you don't fancy wrapping a lot of cake you could parcel it up in a cake box which would make it easier to transport! And could also be used as a wedding favor too!